JB audio transformer. Dual primary & secondary. Two channel. Hermetically sealed, electro-statically shielded. Mfg. P/N: 124P287. NSN: 5950-00-228-0805. Audio transformer. 1500 ohm : 1500 ohm, 10 wv. 300-6K Hz Hermetically sealed. NSN: 5950-845-2297. Freed transformer. 2500 ohm : 250 ohm. 500v, 1.5 watts. 1-3/8" x 1-3/8" x 2". Loral P/N: 450-2046. Microtran audio transformer. NSN: 5950-00-681-7516. New old stock. Altec Lansing scrumptious audio coupling transformer. Sealed. Bottom terminals. 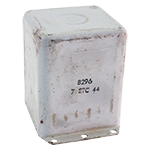 Lionel Corporation Grade 1 Class A plate coupling transformer. Sealed. Made in 1945 for US Army Signal Corps by Lionel, the model train manufacturer turned military supplier. 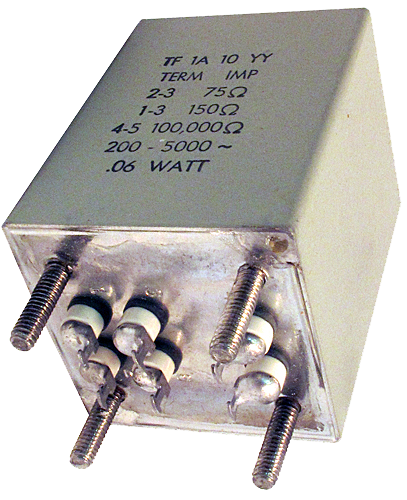 Western Electric output transformer. 200 - 3500 Hz frequency response. Made in 1968. NSN: 5950-235-6758. 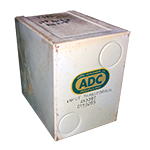 Airdesign Inc. audio interstage transformer. Hermetically sealed. Turret terminals. New, old stock. Collins, CTC audio transformer has lots of miles left. Sealed, bottom terminals, flanges. 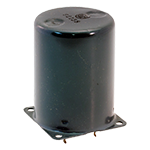 Precision Electronics 2 watt audio interstage transformer. 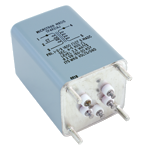 Freed coupling transformer. Hermetically sealed, electro-statically shielded. 800 working volts to ground. Level = 12 watts. Removed from new equipment. Audio transformer. DCR = 30 ohm, 1.5 watts, 18.5 ma. UTC miniature audio transformer. Electrostatic shield. Does not have threaded base. UTC audio frequency transformer. 10k C.T. to 25 ohm. 10 watts. 1:20 ratio. Hermetically sealed. 1-1/2"D x 2-3/8"H. NSN: 5950-231-4763. TRW Pico audio transformer. 105ºC. NSN: 5950-00-449-1742. Atlantic Transformer Corp. audio transformer. (Looks like UTC). 2 watts. Electrostatically shielded. Hermetically sealed. Corner posts 1-3/16" c-c. NSN: 5950-00-615-4876. Beautiful!! TRW Pico interstage audio transformer. 300 ohm to 10 KHz. 10k center tapped to 2k split. 100 mw, 1 ma, 105ºC. 0.337" diameter x 0.469" high. Collins P/N: 677-1521-000. Pico audio transformer. Electrostatically shielded. P/N: L8645. Audio transformer. Hermetically sealed. 2 : 1 ratio. Turret terminals and posts on bottom. NSN: 5950-00-648-5705. UTC audio transformer. Round. Hermetically sealed. Hook terminals. 1.175" c-c ears. NSN: 5950-016-4444. Freed matching transformer. 200 ma. Level = 80 watts. Hermetically sealed. Working volts to ground = 1,100v. Made for 811A circuit. Removed from new, boxed equipment. 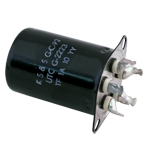 Thordarson Grade 1 Class A plate coupling audio transformer. Sealed. Bottom terminals. Chicago Transformer audio transformer. Hermetically sealed. Rounded corners. Terminals & posts on bottom. 200 - 20,000 Hz I2DB, 265 pwv. NSN: 5950-00-645-0737. Westinghouse audio transformer. 74 / 10 volts, 20 ma. Turns ratio 1 : 3-13/16. 200 - 3000 Hz. 2" diameter x 2.75" high. Made in 1967. NSN: 5950-00-647-7680. NOTE: You will need a 2" capacitor mounting clamp. Bendix audio transformer. 10k : 60k. 150 - 4500 Hz. 0.5 watt. Hermetically sealed. 0.875" square x 2.5" high. Made in 1954. NSN: 5950-645-0716. UTC audio transformer. Hermetically sealed. Electrostatically shielded brought out to terminal. New, military surplus from the 1950s. NSN: 5950-227-7791. ITC audio input transformer. Hermetically sealed. Turret post terminals. 500 vrms. 0.1 watt, 0.1 - 15 kc. NSN: 5950-645-1933. Microphone adapter and Freed audio transformer. 300 - 20,000 ohms. Includes shield box plus 4 pin flange mount female jack (MS3102A14S) mating with 4 pin inline male (MS3106A14S). New surplus. NSN: 5821-591-3786. Audio transformer. 400 - 3000 cps. Hermetically sealed, electrostatically shielded. Gold turret terminals. NSN: 5950-00-647-5943. Freed dual primary audio transformer. ADC audio transformer. 6 solder hooks. Threaded mounting studs. ADC P/N: A16176. Centroid Inc. audio input transformer. Sealed. Bottom terminals. Karas vintage harmonik audio transformer. All stage ratio. New condition. Made in 1925. Only 1 available! Primary Z: 1600 ohms c.t. Microtran audio transformer. 2.5 watt, 150 Hz-20,000 Hz. Hermetically sealed. Mounts by 4 bottom 6-32 studs @ 1.18" centers. DLA900-88-A-A386. UTC/TRW audio transformer. 300Hz (min) to 3.5KHz (max). Hermetically sealed. Internal electrostatic shield brought out to terminal. Turns ratio 1:22.3. Great headphone transformer for high impedance vacuum tube. DLA900-84-P-7603. K&S G-C_92. Microtran Audio Transformer. Hermetically sealed. 70 Hz to 20k Hz. 9 watts. Primary: 10k c.t. unbalanced, 10ma DC. Secondary: 365 ohms. Bottom turret terminals. 2-1/4" x 2" x 3-1/8". Mounting centers 1.68" x 1.43" on 8-32 studs. Made in 1970. Alt. P/N: TF4RX13FA, 1754680. Stancor audio matching transformer. Primary: 5000 ohms, 4.15 Hy, 1500 turns (#34 wire). 115 ohms DCR. Secondary: 600 ohms c.t., 40mA, 82 turns (#25 wire), 0.5 ohms DCR. Hermetically sealed. 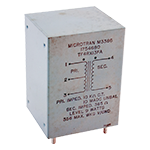 2-1/4" x 2-3/8" x 3"H.
Microtran audio transformer. 4k Ohm c.t. to 600 Ohm c.t. 3mA DC. Hermetically sealed. 7/8"D x 1-7/16"H.
Primary Z: 500 ohms c.t. Secondary Z: 500 ohms c.t. UTC Pico Audio Transformer. Primary: 100k c.t. Secondary: 500 ohms c.t., 300 Hz to 20kHz, 25mw. 100k c.t. to 500 ohms c.t. 3/8"D x 1/2". 1-1/2" gold plated wire leads. Great for vacuum tube to headphone. Pico audio frequency transformer. 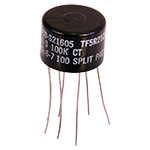 Primary impedance: 100k ohm c.t. (1,2,3), 7 wire lead. 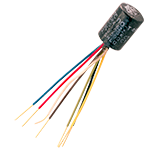 Secondary impedance: 100 ohm @ 300mA DC max (4-5, 6-7). Frequency: 50 Hz minimum, 30 KHz maximum. 1.0mw max. Hermetically sealed. 105° max temperature. 0.52"L x 0.75" outside diameter. Primary: up to 20 madc, 680 ohms c.t. Western Electric range coupling assembly for M33 anti-aircraft gun fire control system. Includes 12 precision resistors 10k to 1 meg. Includes 15 pin Souria connector plug. Gold plated pins, P/N: GS-15134. 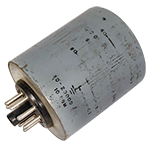 Vintage Western Electric input transformer, 7/8"D x 1-7/16"H. Turns ratio: 2.5 to 1 ratio, 20 Hz - 20 KHz frequency response. Center tapped primary and secondary. 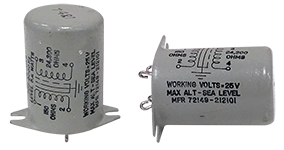 Primary current up to 20 madc, 680 ohms. Secondary: 2.5k ohms. For phase inverting interstage use impedance 15k : 95k. This is a brand new, factory packaged in the 1940's assembly. UTC audio frequency transformer. 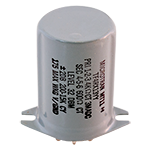 7k ohms primary impedance, 500 ohms secondary, 50 Hz minimum, 10 KHz maximum, 10 watts. 1 to 3-3/4 primary to secondary turn ratio. 4 tab solder lug. Center to center between mounting holes 1.875". ETC audio transformer. 150 ohms : 24,300 ohms. 200 - 6000 Hz. Hermetically sealed. Hook terminals. 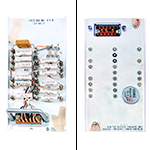 1-15/16"D x 1-3/8"H. For military AN/SIA-120A, a shipboard announcing system. Date: 1974. Audio transformer. Electrostatically shielded. Octal plug base. Used. Writing is faded. ADC First Audio input transformer. Spare for Continental 420. Vintage, very old.